UITableViews are the foundation of many iOS apps. Although they are pretty powerful and flexible, they are also very bland in their default configuration. A quick and easy way to add some style to your boring UITableViews is to add alternating row colors. This gives them some visual ‘pop’ and improves readibility. No fancy design skills required! 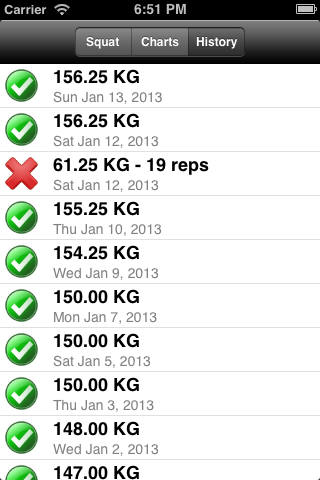 Here is a sample UITableView from 20 Rep Squats. 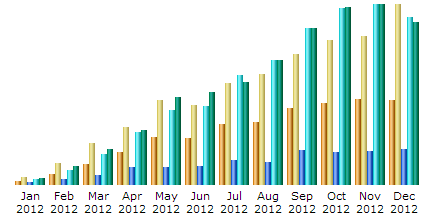 It’s a little bit… monotonous. All we are doing is specifying that even numbered rows will have a white background, and odd numbered rows will have a nice subtle light grey background. Of course, you’ll want to store your background colors in fields or constants, and not have to regenerate them with colorWithRed:geen:blue: every time, but that’s beside the point of this post. And there you have it – with only a few seconds of effort, you can take your UITableViews from blah to beautiful! Or blah to average, at the very least. Announcing: Bug Tracker for iOS! 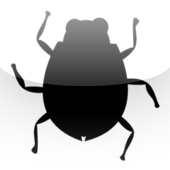 I am happy to announce that my latest app, Bug Tracker, is now available on the app store! Bug Tracker is exactly what it sounds like – a standalone bug tracker for your iOS device. Although it took a bit longer to finish than I had hoped, it was a great learning experience that resulted in a nifty little app as well as an open-source library for making Core Data queries more LINQ-like. A postmortem will be coming soon!